Self-help is a goal-oriented, iterative process to reach and remain at a desired state. The desired state is where you are able to continue the self-help process on your own AND you know when, how, and who to ask for help when necessary. Self-help works because of your awareness, insight, and action. If you cannot do the self-help process for any reason, you should seek outside help. One ideal process for self help is an iterative cycle of four phases: Plan, Do, Check, and Adjust. 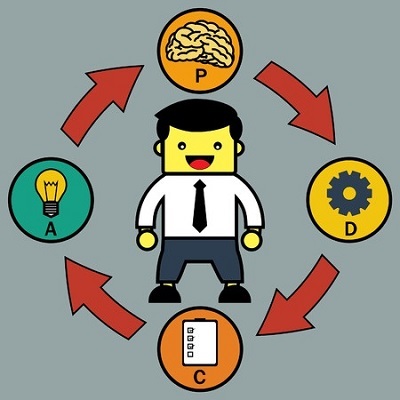 This cycle is often called PDCA, and it has been successfully applied to a variety of complex processes, including management and decision-making in business, research in science, and quality control in manufacturing. 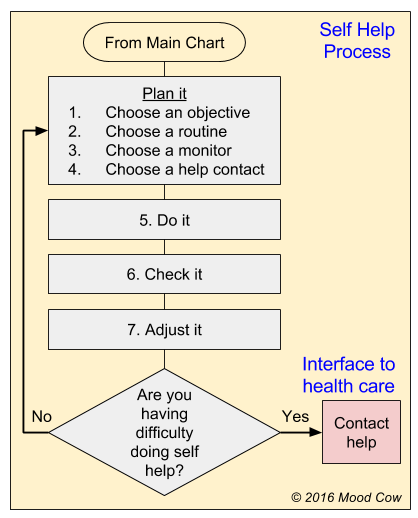 Principled mental care applies the PDCA cycle to the self-help process. The flowchart below illustrates this self help process. 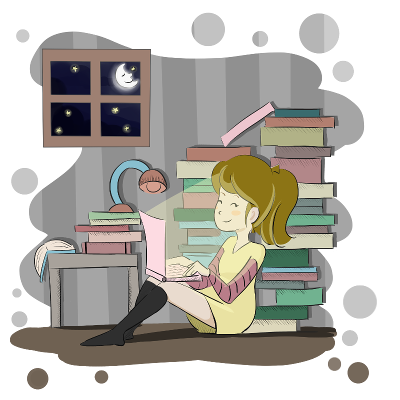 The first step in self-help is to ask yourself what you think you need to achieve right now: relaxation, stimulation, or regulation? For example, if you feel exhausted, anxious, nervous, upset, angry, or too worried, you may need to relax yourself. If you feel bored, depressed, or uninterested in anything, you may need to stimulate yourself. While relaxation and stimulation may help your symptoms for a while, they don't necessarily solve underlying problems. If your condition bothers you quite a bit or is long-lasting, you may need to make problem-solving—in other words, regulation—your objective. Regulation is different from relaxation and stimulation in that problem-solving requires you to think beyond your symptoms and how you are feeling. You need to think about what may be making you feel certain ways, how/why these things are affecting you, and what may help you cope with problems to make you feel better again. Everyone has moments and special circumstances, and we all have to deal with them somehow. The principled framework helps you become aware of what you need to do and encourages you to do it. Once you are aware of what you want to achieve, you need to think about how to achieve it. Principled mental care calls for a simple, routine action that you can do easily and consistently on a daily basis. Just as you brush your teeth every night for dental care or apply moisturizer after a shower for skin care, we want a simple routine for mental care. There are a variety of elements within each of the six modes that will work for your specific needs, preferences, and circumstances. The six natural ingredients of mental care are good choices as your initial routine portfolio. They are your tools, so you just need to choose one and try it. Imagine a diet plan without a scale. How would you know if you are losing or gaining weight? You wouldn't. The same applies to mental care. You need a way to monitor your condition to know if you are achieving your objective. Unlike body weight or temperature, mental condition is not easily measurable in numbers. Fortunately, there is a time-tested method that works for mental care: a mood diary. Simply writing down your mood as part of a routine helps you improve your awareness and gain insight into your well-being. For those who prefer a more convenient method of journaling, there is an increasing number of mobile applications that are specifically designed to keep a record of your mood. Take a look at Mood Cow Dashboard, for example. The last step of your self-help planning is to identify your primary support. If you need help, who do you call? How do you reach that person? Traditionally, such support used to be friends and family members. If you have someone in your family or friend group you can trust and rely on to call anytime, anywhere, for any reason, then great. Keep that in your record and use it. If you can’t think of anyone, don't worry. Use your health care provider. They are reliable, trustworthy, resourceful, and most importantly, they care for you. Make sure not to hesitate to use your help contact. It’s time to actually do the routine you chose. Use your monitor to see how you are doing. Your initial choice of routine may or may not have worked. Adjust your routine if needed. As you complete the first cycle of PDCA, this is a good time to reach out to your help contact and share your insights about what worked, what didn't, and why. Schedule a meeting regularly—perhaps twice a year. Review and update your plan. Then, the cycle continues. Next, we explore the best first resource for self-help.